When you need the most durable flooring options for your home, the choice of tile flooring is clear. For high-traffic areas, there are many tile floor options from which to choose, each with its own advantages. Let the experts in tile flooring installation in Greenville, SC, help you choose among the many options for your new durable, low-maintenance tile flooring. Hurry in to our warehouse showroom today and let Greer Flooring Center, Inc., give you a guided door of our full stocks of tile floor options. When considering tile flooring, there are three factors to keep in mind: affordability, durability, and style. All tile flooring provides a durability advantage over most other types of flooring. However, there are three main types of tile flooring with various advantages over each other. The three tile floor options are ceramic tile, porcelain tile flooring, and tiles of natural stone. Throughout history, ceramic has been the go to choice for versatility in architecture. Classical ceramic tile was the wedding of beauty with durability to create long-lasting buildings and other edifices. In modern times, ceramic tile engineering has advanced significantly. This has made ceramic tile flooring one of the most flexible options for long-lasting tile flooring installation. Because it can be easily created in almost any color or style, ceramic tile floor options are almost limitless. Ceramic tiles can be baked in many different shapes as well, to fit any space. All of this makes ceramic tile flooring installation one of the cheapest tile floor options by square foot. Installation is fast and easy and ceramic tiles are affordable, so the savings in labor and materials give you more cash left over for other home improvement projects. Ceramic tile is very durable, but even if one tile were to be damaged, an individual ceramic tile flooring square is cheap and simple to replace. Tile floor options in porcelain are often the best choice for the bathroom or other area where a lot of water might be spilt. In a busy family bathroom, the low water absorption of porcelain tile will reap dividends in maintenance and lifetime. Porcelain tile flooring resists water stains and scratches, and is easy to care for. If you mop regularly and do an occasional polish, your porcelain tile floor installation will look great for years. When you need tile floor options for an indoor/outdoor space such as a doorway or patio, porcelain’s frost resistance will keep it looking great year-round. 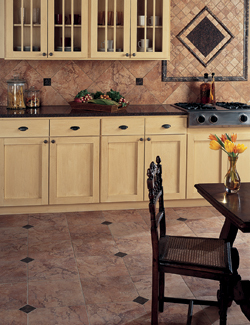 Classic beauty meets lifetime durability in the natural stone tile floor options. For high-traffic areas where guests congregate, granite, marble, limestone, or slate tile flooring will stand the test of time while never failing to impress. Whether you want the convenience of low-maintenance granite or the elegance of marble, come in today and explore your natural stone tile floor options with the help of our experts.